The Muslim terrorist group ISIS, or the Islamic State of Iraq and Syria, has released video footage of a man being beheaded by the group, who is believed to be an American freelance journalist held hostage in Iraq for two years. James Foley, 40, appeared Tuesday in the release of a video entitled Message to America, which was posted to social media sites by a member of ISIS. A masked Islamic fighter also appears in the footage, with a man in an orange suit identified as the journalist kneeling by his side. 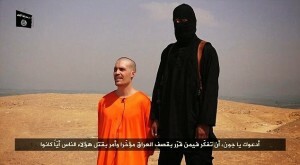 Foley then proceeds to present a speech, which some believe was crafted or influenced largely by his captors. The ISIS fighter also issues a warning in the video to anyone that might interfere with Islamic rule, including to Barack Obama. “So any attempt by you, Obama, to deny the Muslims their rights of living in safety under the Islamic caliphate will result in the bloodshed of your people,” the masked terrorist warns. He then proceeds to decapitate Foley. TIME Journalist Steven Joel Sotloff, who has been missing since last year, also appears in the video footage as threats are made that he will meet the same fate if the U.S. continues airstrikes on the Muslim group. “The life of this American citizen, Obama, depends on your next decision,” the ISIS fighter declares. Foley’s mother, Diane, released a statement following word of her son’s death. As previously reported, ISIS members also released video footage threatening the U.S. on Monday, the day before Foley’s execution was posted online. The short, 45-second video contained the message “We will drown all of you in blood” and simulated blood splattering an American flag.